Modern, very stylish FM radio and speaker system for a connected computer, MP3 or CD player, iPhone and iPod. 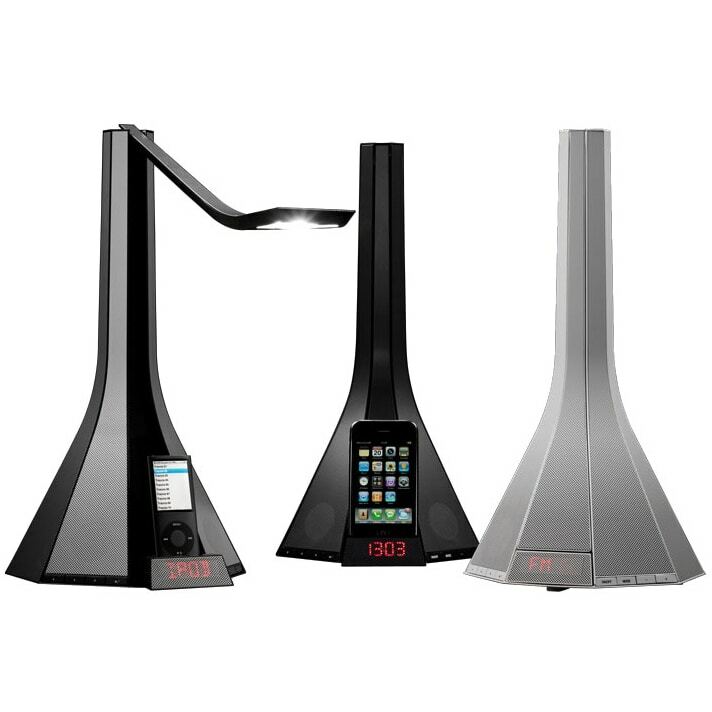 Diva is a LED light and music system specifically designed for your iPod or iPhone. It combines multiple functions in one light, compact object, eliminating clutter and stealing the scene no matter where you place it. The anodised, screen printed aluminium jacket makes Diva a mysterious musical instrument, only revealing its many functions when open. But even when closed, it's an FM radio and speaker system for a connected computer, MP3 or CD player. Insert your iPod or iPhone by releasing the retractable docking station drawer. The sound quality is full and rich, thanks to the four, high quality speakers housed in its body. Pressing a button opens the die-cast aluminium lamp arm. Raise this to whatever position is most comfortable to read or to light your workstation. The lamp's cutting edge LED light is warm, highly effective and energy efficient at 4,5W. A digital screen is hidden behind the anodised aluminium, to show the time and all the other information about Diva's various uses and FM stations. An infrared remote control governs every function, including your iPod and the radio. The back of Diva comes with a AUX socket for playing music from MP3 players, CD players, computers, etc. ; a USB socket to play music from a flash drive; an audio-out socket to connect to external speakers. Polycarbonate injection moulded plastic parts. Anodized, screen printed aluminium jackets. Casted aluminium lamp arm, with a LED source. Retractable docking drawer with iPod®/iPhone® connector. 4 drivers, 6 Watt per channel. FM radio. Back connectors: USB, Audio in, Audio Out, power cable. Infrared remote control. Suitable for iPod mini / nano / classic and touch as well as for iPhone 3G, 3GS and 4. The lamps cannot be replaced. Enlightenments - both in the sense of enlightenment and of illumination. Is the claim Rotaliana adopted to show that in all its product there is a part - whether it be big or small - of an "enlightening" qualities for the intuition and disclosure of new solutions for the daily life. Do you have a question about "Diva"? How can we contact you?